If you’ve got kids, then the chances are you know what it’s like to live with fussy eaters, because at one point or another, most kids go through a picky phase when it comes to food. When your child refuses to eat anything but cheese sandwiches and mashed potatoes, of course, you are going to be worried. However, it’s important to remember that it’s just a phase and sooner or later they will grow out of it. 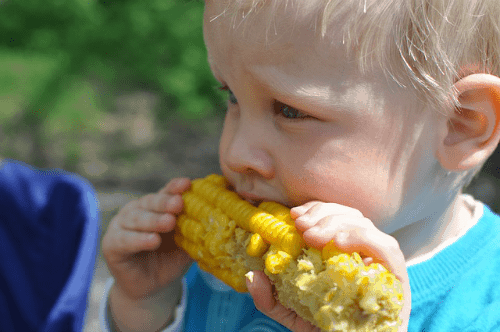 That being said, when it comes to raising kids who are happy to eat anything and everything, there are some simple steps that you can take to improve your kids’ taste palates. They may still prefer cheese sandwiches to everything else, but there are simple ways you can get them eating other foods and expanding their palates. Want your kids to be happy to eat lots of different foods? Yes – then take note of the six must-try hacks below for expanding their palates. Don’t make the mistake of becoming a short-order cook – aka a mom who cooks three different meals because no one likes the same foods. 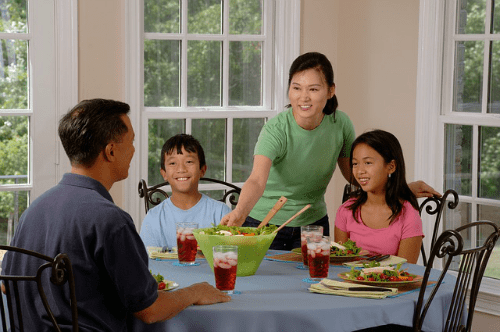 If you want your children to develop healthy eating habits, it’s important to encourage them to try new foods by serving one meal for everyone. However, to ensure that they are not put off the rest of their food by things they don’t like, serve up family style and let everyone help themselves to what they want. Eating at the same time as your kids is important, as often children mimic their parents’ behavior. So, if they see you eating certain foods, the chances are they’ll try them too. Say, for instance, one child has always refused to eat mushrooms, if they see the rest of the family eating them and saying how nice they are, eventually, they will want to try them too. One reason that today, a lot of kids have bad palates is because they are brought up on low-quality food. Value meat, fish, and vegetables might look the same as their premium counterparts, but the reality is that the taste is very different. Believe it or not, there’s a big taste difference in quality food, so kids who are brought up on higher quality meat, fish, and vegetables, are more likely to have a better taste palate, and are also more likely to be healthier. Whether you’re on a budget or not, you can still feed your family high-quality foods. The thing is it’s about quality, not quantity, instead of packing your meals out with lots of meat, add lots of vegetables to them. This means that you will use less meat and fish, and so, will be able to afford higher quality produce. Say, for instance, you are making a fish pie, instead of buying fish from your local supermarket, use fish from a quality online fish market. That way you know that it’s of a high-quality, and so, will taste better and be better for you and your kids than the cheaper supermarket version. An easy way to trick your kids into trying new flavors that they otherwise would refuse to eat is to add them to old favorites. So, say lasagna is a favorite in your house, and you want to get your kids eating carrots and red pepper, blend them into the tomato sauce so that they don’t know that they’re there. They will then get used to the taste of them so that when you serve them peppers and carrots in other dishes, they will be more likely to like them. The truth is that a lot of foods kids don’t like require an acquired taste, such as olives and goats cheese. In time, as their palates develop and change, the chances are that they will like most of the foods that they’ve disliked in the past. The more flavors they eat, the more likely they are to have a good palate by the time they are adults. A fantastic way to get kids to try new foods is to cook with them. This might sound strange – showing them what goes into their food, but if you want to get your kids to eat anything and everything, teaching them to cook is a must. Believe it or not, when kids cook, they become more open to trying new things, especially when it’s something that they’ve made. With that in mind, perhaps you could have one or two nights a week where you cook as a family, allowing your kids to get stuck in and help out. It might mean that dinner takes longer to make and that the kitchen ends up in more of a mess, but if it encourages your little ones to try new things, it’s more than worth it. Don’t make the mistake of allowing your children to eat junk food. Remember that when it comes to what your kids are allowed to eat, you are the parent, you are in charge. Don’t allow your little ones to eat junk food. Because if you do, they will be more likely to refuse to eat healthy foods because compared to junk food, they will taste flavorless. Junk food is packed full of additives and flavor enhancers, making crisps, cakes, and sweets taste much better than they actually do. Kids who eat a lot of junk food tend to be fussier than kids who eat mainly healthy, homemade foods. So, if you want to ensure that your kids grow up to have good palates, don’t let them eat junk food, cook from scratch. From main meals to snacks, make as much as you can yourself. Eating out on a regular basis at nice restaurants will help to develop your children’s palates. The food served in restaurants always tends to have a stronger flavor than the food that we would serve at home. So, taking your children to eat out in nice restaurants is a great way to help their palates develop. When eating out, a lot of children order things that at home, they would probably refuse to try. This gives them the opportunity to try new flavors and enhance their palates, helping to make them less fussy eaters. So, there you have it, six must-try hacks for expanding your kids’ taste palates.